If your business or client has a Facebook business page you’ve probably seen a notification flash on your screen in the last week or so, alerting you it will be transitioned to a new layout this week. This means a major Facebook Business Page update. Let the shock and awe commence. When Facebook announces changes of any type it normally induces feelings of fear, trepidation, excitement, anxiety, panic, <insert your emotion here>. You may have already transitioned your page and figured you’d let the cards fall as they may. You like to live dangerously. Or you may be waiting. Counting down the days until August 23rd like it’s Y2K all over again. Whatever course of action you take you can party like it’s 1999 and rest easy. These changes only offer great things for your Facebook local business page. Why the Facebook Business Page Update? The goal of this Facebook Business Page update is to make it easier to interact with local businesses. This is akin to renting an apartment from a landlord and having them upgrade it to meet your needs and improve your life. Free of charge. Can we take a moment and say, “Thank you, Facebook.” All together now. We spend a lot of time complaining about things Facebook does TO us when really Facebook doesn’t do anything to us. Facebook runs a business and allows us to reap the benefits of their operations. Facebook does things they feel are in the best interest of its business and mission. Sometimes that helps us obviously and immediately. Sometimes that requires us to change our strategy a bit, but ultimately will help us use Facebook effectively. Learn to live as one with Facebook and your life will be much easier and peaceful. OK, now that we had that moment of gratitude, let’s go over some of what’s included in this Facebook Business Page update (and what it means for you). Previously, Facebook provided a CTA button on the top of the page to allow people to “Book an Appointment,” “Reserve,” “Buy,” or whatever your goal conversion. This CTA button took the user to the landing page URL you specified. While that is still an option, the current Facebook Business Page update also allows customers to convert without leaving the platform. This is a win for you and a win for Facebook. Yay! Your goals and Facebook goals align! Facebook goal: keep people in Facebook-land for as long as possible. Your goal: convert more customers by making the conversion process quick and easy. Now there are still reasons you’d want to move people to a landing page you own (collect emails, get into a lead funnel, etc.) but for a lot of interactions local business focus on and want to promote through their Facebook local business page—reservations, appointments, ecommerce—this just eliminates some steps for the customer. The hope is the ease of user experience for customers also improves conversion rate to buyers. You also can now connect Facebook directly with your Google Calendar so appointments are recorded there. Facebook will act as your CRM and send your customer a reminder and a post-appointment or post-sale thank you/review request. Whatever you’d like. You create and customize the content for each. In conjunction with the booking feature, the Facebook Business Page update enables you to highlight your products or services on your Facebook page and have people learn more about them and buy, book, or reserve right there. You can add product description, price, even a photo. Thirty-five million people look at a public event on Facebook each day. Seven hundred million use Facebook Events to market their event each month. That’s more than double the U.S. population. In fact, that’s more than the combined populations of the U.S., Russia, Mexico, and Egypt. So, safe to say the Facebook Event function is kind of a big deal. A platform to more easily create, manage, edit, and publish multiple events. Integration with ticket booking platforms so people can book tickets right from your page. In 2016 Facebook launched the recommendations function. A person can ask for a recommendation and when people respond the business page auto-populates in their comment. In this Facebook Business Page update, they take it one step further and allow people to add their recommendation right on your page. The recommendation needs to be at least 25 characters long (in an attempt to make them more valuable). Tags will work a bit like hashtags, but also sort of like tags on a blog. They allow users to understand what your business is known for and help Facebook categorize your page for search. Have you transitioned to the new format yet? Do you have a plan for how you will use the new features? Have you seen organizations use them particularly well? 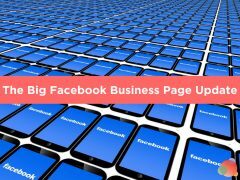 Would love to hear how you plan to use the Facebook Business Page update to achieve your communications goals.